ALFA, 2019. 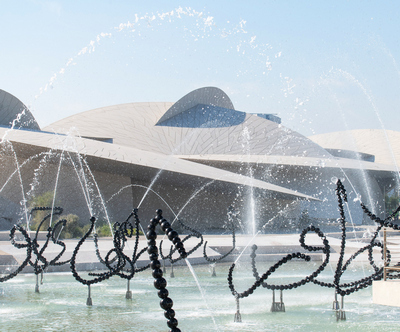 Sculpture Fountains permanently installed in the lagoon of the National Museum of Qatar, Doha. 지난 3월 28일 프랑스 건축가 장 누벨(Jean Nouvel) 설계로 전 세계의 이목을 집중시킨 카타르 국립박물관이 10여 년 만의 공사를 마치고 공식 개관하였다. 이와 함께 박물관과 페르시아만 중간에 위치한 긴 라군에 설치된 프랑스 조각가 장-미셸 오토니엘의 대형 설치 신작 <ALFA>(2019)가 공개되었다. 약 5년에 걸쳐 진행된 오토니엘의 기념비적인 설치작 는 인근 사막의 식물과 아랍어의 특정 문자에서 영감을 받아 추상적 형태로 재해석한 신작으로 총 114개의 분수 조각이 900미터에 걸쳐 9개의 그룹으로 나뉘어 구성되었다. 그간 오토니엘의 작업에서 주요하게 사용된 유리 구슬이 아닌 검은색의 메탈 구슬 5,000개로 제작된 이 작품은 현존하는 작가의 작업 중 최대 규모이며 그간 많은 주목을 받은 프랑스 베르사유 궁전 정원의 영구 설치작 <아름다운 춤(Les Belle Danses)>(2015)의 다섯 배에 달한다. 최대 5.2 m에 달하는 의 개별 분수 조각에서 뿜어져나오는 아라베스크 문양의 물줄기들은 '사막 장미(desert rose)'의 꽃잎을 연상시키는 카타르 국립박물관 건물의 유려한 곡선과 조응하며 장관을 이룬다. The National Museum of Qatar, having drawn worldwide attention for its building designed by the French architect Jean Nouvel, has officially opened on March 28, 2019, after having been under construction for over a decade. In conjunction with the grand opening, Jean-Michel Othoniel unveiled his newly created monumental installation ALFA (2019), which covers the entire surface of the gigantic lagoon located between the National Museum of Qatar and the Persian Gulf. Inspired by Arabic calligraphy and wild reeds, this monumental installation has taken 5 years to be created and consists of 9 groups of 114 sculptures that provide abstract interpretations of the region’s visual vocabularies. Instead of the glass beads that have been primarily used in the works of Othoniel, this time the artist has used more than 5,000 black-colored metal beads to shape the sculptures, evoking the region’s natural reeds with their reflections along the 900-meter-long shores of the lagoon. This large-scale installation is by far the biggest of all monumental projects the artist has ever created—five times larger than his signature artwork Les Belle Danses (2015) permanently installed at the Versailles in France. The tallest sculptures reaching up to 5.2 meters, the installation is also transformed into a group of fountains, launching arabesques of water toward the sky and hugging the curves of the museum’s architecture that echo the shape of desert roses. City in the Sky, 2019, stainless steel, steel, aluminium acrylic glass, LED lights, 400 x 500 x 220 cm. 듀오 아티스트 엘름그린 & 드라그셋은 오는 3월 29일부터 31일까지 열리는 아트바젤 홍콩(Art Basel Hong Kong) 인카운터스(Encounters) 부문에 참가한다. 가상의 도시를 설계 및 축소하여 뒤집은 형태로 재현한 <City in the Sky>(2019)는 홍콩, 상해, 런던 등 현대에 들어 새롭게 부상한 금융 중심지로부터 영감 받은 작품이다. 전형적인 현대 도시의 건축 디자인으로 표현된 가상 도시의 마천루는 반짝반짝 빛나며 흡사 만화경을 들여다보고 있는 듯한 느낌을 자아낸다. 메가급 대도시들 간의 경쟁이 고조됨에 따라 각 지역의 정체성은 세계 곳곳에서 발생하는 다양한 사건에 영향을 받게 되는데, 이런 과정을 통해 각 도시에 내재된 야망이 발현하고 궁극적으로 도시의 경관에까지 복합적인 영향을 미치게 된다. 덴마크 오르후스의 공공도서관 DOKK1의 커미션작업으로 선보인 <Magic Mushrooms>(2015)에서 출발한 작가의 일련의 모험이 이번 신작 <City in the Sky>로 이어졌는데, 이로써 관람객으로 하여금 자신들이 꿈꾸는 이상적인 도시에 대해 반추하도록 한다. 또한 엘름그린 & 드라그셋은 아트바젤 홍콩이 같은 기간 마련하는 토크 프로그램 “A Common Place? | Artists in Art Fairs”에도 참여한다. 대만 작가 황하이신(Hai Hsin Huang), 독립 큐레이터 파코 바라간(Paco Barragán), 칠레 작가 이반 나바로(Iván Navarro)가 패널로 함께 참여하며, 문화, 정치, 사회, 경제가 교차하는 역사적 공간으로서의 아트 페어에 대한 흥미로운 이야기를 나눌 예정이다. 아시아 아트 아카이브(Asia Art Archive)의 Özge Ersoy의 사회로 진행되는 본 행사는 3월 29일(금) 오후 2시부터 오후 3시 30분까지 홍콩 컨벤션 센터에서 개최된다. The artist duo Elmgreen & Dragset will participate in the Encounters sector of this year’s Art Basel Hong Kong, which will open from March 29 to 31, 2019. The pair will showcase City in the Sky (2019), a new installation which manifests an imaginary city in a scaled model, installed upside-down. Inspired by the new financial centers of megacities such as Hong Kong, Shanghai, and London, it offers a kaleidoscopic overview of a fictional urban landscape in which illuminated skyscrapers are rendered as post-architectural archetypes. As the competition among global metropolises intensifies, local identities are influenced by events in other parts of the world, resulting in complex layers and aspirations that impact the cityscape. The installation prompts viewers to imagine their own ideal city. City in the Sky explores ideas first dealt with in Magic Mushrooms (2015), the duo’s permanent commission for DOKK1 in Aarhus, Denmark. Elmgreen & Dragset will also participate in Art Basel Conversations A Common Place? | Artists in Art Fairs on Friday, March 29. The panel will be held from 2pm - 3:30pm at the Hong Kong Convention and Exhibition Centre and will be moderated by moderated by Özge Ersoy, Public Programs Lead at Asia Art Archive, Hong Kong. Other panelists include Hai Hsin Huang, Paco Barragán, and Iván Navarro. Elmgreen & Dragset’s Queer Bar/Powerless Structures, Fig. 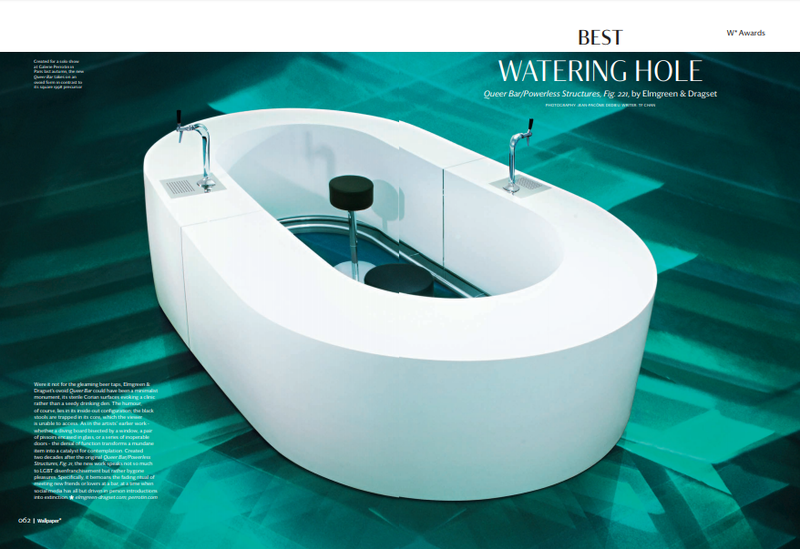 21 (2005) is chosen as the winner of 2019 Wallpaper* Design Award. In contrast to the meaning associated with the title, this work speaks not so much to LGBT disenfranchisement but rather bygone pleasures. Specifically, it bemoans the fading ritual of meeting new friends or lovers at a bar, at a time when social media has all but driven in-person introductions into extinction. A work from the same series will be shown at Kukje Gallery’s Elmgreen & Dragset exhibition which will open on March 21 through April 28. It will be a new major work in a circular form of 2 meters in diameter criticizing power and stereotypes in institutions. 듀오 아티스트 엘름그린 & 드라그셋이 영국 유명 건축·디자인 잡지 월페이퍼(Wallpaper*)가 주는 ‘2019년 월페이퍼 디자인 어워드’의 수상자로 선정됐다. 수상작 (2005)은 제목에서 연상되는 의미와는 대조적으로 성적소수자(LGBT)의 권리 박탈 문제보다는 지나간 즐거움에 대해 말한다. 특히, 소셜미디어가 사람들이 직접 대면하는 교류를 없애고, 더 이상 새로운 친구나 인연을 술집에서 만나기가 점점 어려워지는 안타까운 현실에 대해 한탄한다. 한편 엘름그린 & 드라그셋은 오는 3월 21일부터 4월 28일까지 국제갤러리에서 개최하는 첫 번째 개인전에서 같은 시리즈의 작업을 선보일 계획이다. 지름 2 m 남짓한 원형의 형태로 제작된 신작은 제도권 내 권력이나 고정 관념을 비판하는 작가의 주요 작업 중 하나이다. 전시제목: The STREET. Where the world is made. The exhibition is organized based on themes – public actions, daily life, politics, the community, innovation, the role of the institution – fundamental for understanding the new functions and identity of the modern-day street. Gimhongsok, together with Chen Shaoxiong and Tsuyoshi Ozawa as the project group ‘Xijing Men,’ will show I Love Xijing – The Daily Life of Xijing Presidents (2009), and Kimsooja will present A Needle Woman (2009), which investigates metaphysical themes of consciousness and social identity. 김홍석과 김수자는 이탈리아 국립로마현대미술관에서 개최하는 그룹전 《The STREET. Where the world is made》(2019년 4월 28일 폐막)에 참가한다. 전세계에서 온 140여 명의 작가들이 참가, 200여 점 이상의 작품을 소개하는 이번 전시의 공간은 다문화와 다중언어를 비롯해 다채롭고, 자극적이며, 귀를 먹먹하게 할 정도로 시끄러운 전세계의 거리, 즉 현대 사회의 모세혈관인 길의 이야기로 구성된다. 전시는 길거리의 풍경을 현대성의 실체를 들여다볼 수 있는 중요한 모티프로 설정했다. 현대 거리의 새로운 기능과 정체성을 이해하도록 공공의 행동, 일상적인 삶, 정치, 지역사회, 혁신 그리고 기관의 역할과 같은 기본 주제들을 이야기한다. 김홍석은 중국 아티스트 첸 샤오시옹(Chen Shaoxiong)과 일본 아티스트 츠요시 오자와(Tsuyoshi Ozawa)와 함께 결성한 프로젝트 그룹 ‘시징맨(Xijing Men)’으로 참가해 (2009)을 선보인다. 김수자는 시각적인 이미지 및 오브제 이상의 정신적이고 철학적인 탐구를 통한 다양한 문화와 삶의 인류학적 면모를 보여주는 작업 <바늘 여인>(2009)을 소개한다. 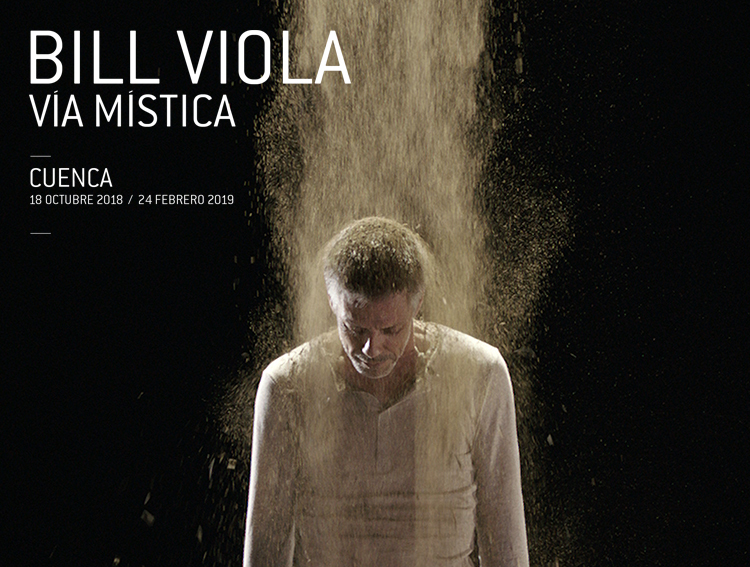 Bill Viola is featured in a solo exhibition titled Vía Mística at the city of Cuenca in Spain, a new cultural initiative and exhibition of national and international scope through February 24, 2019. The exhibition features works inspired by historic sites as well as museums at Cuenca. This project, curated by Viola's wife Kira Perov, features a total of eighteen works by the artist focusing on spirituality that have been distributed among venues located in Cuenca's historical center with four works currently on view at the Museo de Arte Abstracto Español. This exhibition is organized by Eulen Art with the support of the Junta de Castilla-La Mancha. 빌 비올라는 다양한 전시를 개최하며 새로운 문화의 부흥지로 떠오르고 있는 스페인의 쿠엥카 지역에서 2019년 2월 24일까지 개인전 《Vía Mística》를 선보인다. 이번 전시의 특징은 쿠엥카의 미술관뿐만 아니라 역사적 장소에 영감을 받은 작품 구성으로 선보인다는 점이다. 작가의 부인이자 이번 전시를 큐레이팅한 키라 페로브(Kira Perov)는 지역에 깃든 영성(spirituality)에 초점을 맞춘 총 18점의 작품을 지역 곳곳에서 소개하며, 그 중 네 작품은 쿠엥카 스페인 추상 미술관(Museo de Arte Abstracto Español) 공간에서 보여진다. 이번 전시는 카스티야라만차 위원회(Junta de Castilla-La Mancha)가 후원하고, 을렌 아트(Eulen Art)가 주최했다. Jenny Holzer is currently participating in a solo exhibition titled ARTIST ROOMS: Jenny Holzer at London’s Tate Modern through July 23, 2019. 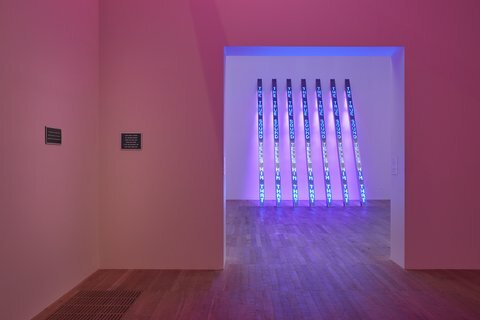 The show brings together key works from across Holzer’s four-decade career, including rarely seen works from the artist’s archives and installations exhibited in the UK for the first time, in Tate Modern’s dedicated ARTIST ROOMS gallery. The show will present Holzer’s early series Truisms 1977–79, as well as Redaction Paintings, begun in 2006, which reproduce declassified government documents relating to American and British interventions in the Middle East. Other highlights include an LED sculpture titled FLOOR 2015, originally intended for display on the ground, but which the artist has chosen to mount to the ceiling, allowing audiences to experience the work from a different vantage point. 제니 홀저는 런던 테이트 모던(Tate Modern)에서 개인전 《ARTIST ROOMS: Jenny Holzer》를 2019년 7월 23일까지 선보인다. 이번 전시는 40년간 작업한 제니 홀저의 주요 작품들을 한데 모으고, 지금까지 볼 수 없었던 작가의 아카이브 및 설치 작업을 처음 공개한다. 전시에서는 제니 홀저의 초기 연작 (1977-99)를 비롯해 2006년 중동에서 미국과 영국의 개입과 관련된 기밀 해제 정부 문서를 복사하는 작업 가 함께 소개된다. 이 밖에 제니 홀저의 LED 작업 (2015)는 기존 설치 방식과는 달리 천장에 설치한 작업으로, 관객들이 다각도에서 작업을 경험할 수 있도록 했다. 구본창은 국제갤러리 부산점에서 개인전 《Koo Bohnchang》을 2019년 2월 17일까지 선보인다. 국제갤러리 부산점의 첫 번째 기획전이자 국제갤러리에서 열리는 작가의 세 번째 개인전 《Koo Bohnchang》전은 작가가 지난 30여 년 동안 통찰력과 감성 그리고 표현력으로 일구어온 독창적인 작품 세계 및 현 경향을 만날 수 있는 기회를 제공한다. 구본창은 사진 매체의 가능성을 끊임없이 모색하며, 국내에서 사진이 현대미술의 주요 장르로 확고하게 자리매김하는데 유의미한 역할을 해왔다. 세상과 소통하기 위한 방법으로 사진을 선택한 후 파격과 실험을 거듭하던 그는 한국의 전통문화를 현대적인 감각으로 재해석하는 작업에 이르게 된다. 그 중 백자, 카메라, 작가의 완벽한 일체감을 보여준 <백자> 연작은 우연과 필연으로 직조된 구본창의 예술여정 중에서도 작업세계를 확장하는데 결정적인 역할을 했다. 또한 이번 전시에서 처음 선보이는 <청화백자> 연작은 유물이 존재했던 당대의 기호, 욕망, 가치 등의 화두를 서정적으로 풀어냄으로써 존재 자체를 사색하도록 만든다. <백자>와 <청화백자> 연작을 통해 “모든 사진은 존재와 부재의 갈림길이다”라는 작가 자신의 말을 스스로 증명하는 구본창은 소유한 사람도, 그의 욕망도, 그가 살던 시대도 사라지고 유물만 남은 상황을 오롯이 담은 사진을 통해 ‘시간성’, ‘덧없음’ 등 그의 작업 내면에 맥맥이 흐르는 주제를 강조한다. 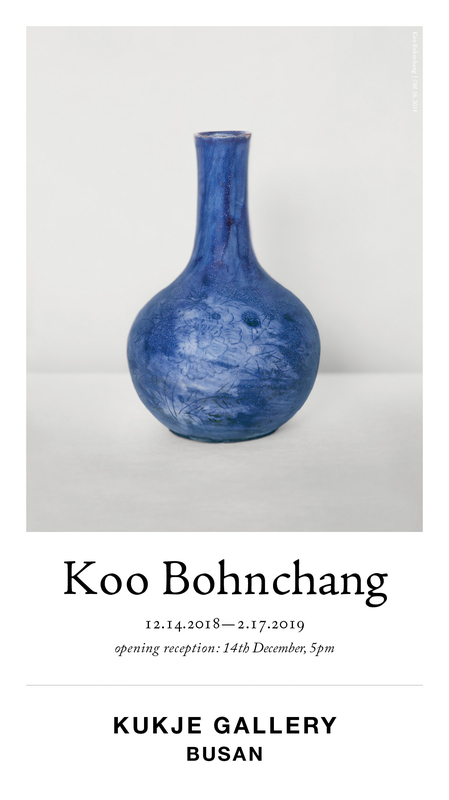 Kukje Gallery is pleased to present Koo Bohnchang, a solo exhibition of the artist on view at Kukje Gallery’s Busan space. This marks Koo’s third solo exhibition at Kukje Gallery, and is the first curated exhibition held in Busan since its opening. The eponymous solo exhibition will serve as a comprehensive introduction to the artist’s photographic œuvre of nearly three decades and will provide an invaluable opportunity to experience Koo’s unique philosophy and compelling images. During the course of his career, Koo's constant investigation into the possibilities of photography has played a pivotal role in establishing the medium as a major genre of contemporary art in Korea. Committed to using photography as a means to communicate with the world, the artist has continued to experiment and push the boundaries of the medium. Consequently, his work has evolved to encompass an expansive and ongoing project of viewing and reinterpreting Korean cultural artifacts through a modern lens. His best-known series Vessels explores the harmony between the white porcelain masterworks of the Joseon Dynasty (1392 – 1897), the camera, and the artist. The series in particular has played a seminal role in expanding his practice within the context of an artistic journey woven in coincidence and necessity. The Blue-and-white Porcelain Jar series, which will be exhibited for the first time since its creation in 2014, engages with the subjects of contemporary taste, desire, and value, thus encouraging the audience to contemplate the objects’ subjectivity. Koo's Vessels and Blue-and-white Porcelain Jar series both exemplify the artist’s view that, “[p]hotographs are a dividing line between existence and absence.” That is to say, despite the loss of links to these objects’ original owners, initial values, and context, the objects themselves remain a powerful presence. The photographs capture this longevity and aura, emphasizing the two main motifs of Koo’s work: time and impermanence in the human condition. 달라스 컨템포러리(Dallas Contemporary, Texas)미술관에서 가다 아메르의 개인전 《Ceramics, Knots, Thoughts, Scraps》이 올해 12월 17일까지 선보인다. 이번 전시는 가다 아메르의 세라믹 작업 전반을 처음 선보이는 자리로, 기존 자수회화 작업으로 알려진 작가의 새로운 매체 탐구의 과정과 결과물을 소개한다. 가다 아메르는 접시 등 3차원 형태의 구상 작업을 비롯해 ‘Knots’, ‘Thought’s, ‘Scraps’라고 명명한 작업을 함께 선보인다. 기술과 표현을 다루는 이 작업들은 추상적이고 과정중심적이며, 가다 아메르의 창조적인 과정과 실험적인 투자에 대한 통찰력을 제공한다. 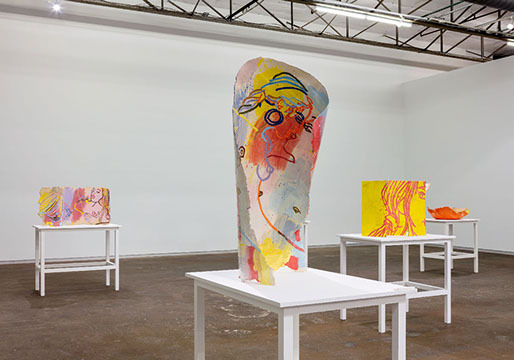 Ghada Amer is featured in a solo exhibition titled Ceramics, Knots, Thoughts, Scraps at Texas Dallas Contemporary through December 17, 2018. Ceramics, Knots, Thoughts, Scraps is Amer’s first exhibition dedicated to ceramics. Known for her embroidered works on canvas, Amer has recently turned to a new medium. In conjunction with her figurative works such as plates and three-dimensional forms, Amer also presents pieces she refers to as Knots, Thoughts, and Scraps. Abstract and process-driven, they offer insight into the artist’s creative process and investment in experimentation. 양혜규가 뉴질랜드 고벳 브루스터 미술관에서 2019년 3월 18일까지 개인전 《생을 위한 삼중 둥지 틀기》를 선보이고 있다. 이번 전시는 올해 여름 호주 브리즈번 현대미술관(IMA)에서 성황리에 개최되었던 양혜규의 호주 첫 번째 개인전의 순회전으로, 조각과 설치, 영상 작업들을 소개한다. 이번 전시 공간에는 양혜규의 비디오 에세이 <쌍과 반쪽 – 이름 없는 이웃들과의 사건들>(2009)과 오디오 작업 <모래 동굴 안의 곰 여인 이야기>(2009/2011), 그리고 블라인드 설치작 <치명적인 사랑>(2008)이 서로 얽히듯 연결되어 있다. 《생을 위한 삼중 둥지 틀기》가 제의하는 역사적 인물이나 기이한 캐릭터들, 소외감과 이웃에 대한 양혜규의 자기 반영적인 사유들은 각 캐릭터들이 서로 얽혀 있는 상호 연결된 현실을 반영한다. 특히 문화, 스포츠, 사업, 정치를 포함한 다양한 분야의 저명인사들에게 대여받은 가구를 전시하는 양혜규의 설치 작업 (2001/2018-19)가 이번에 새롭게 공개되어 일시적 ‘공동체’를 구성한다. Haegue Yang is featured in a solo exhibition titled Haegue Yang: Triple Vita Nestings at New Zealand’s Govett-Brewster Art Gallery through March 18, 2019. 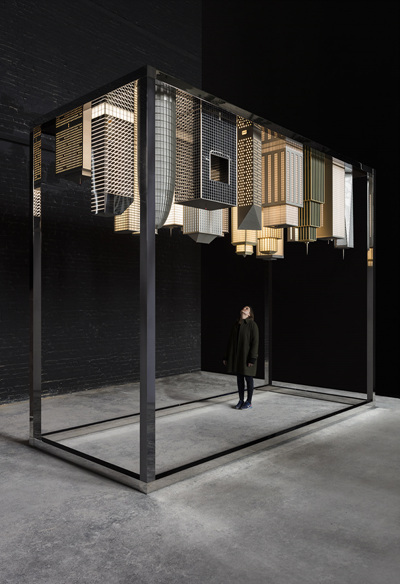 As a traveling exhibition which successfully opened at the Institute of Modern Art in Brisbane, Haegue Yang will show her installations and video works. 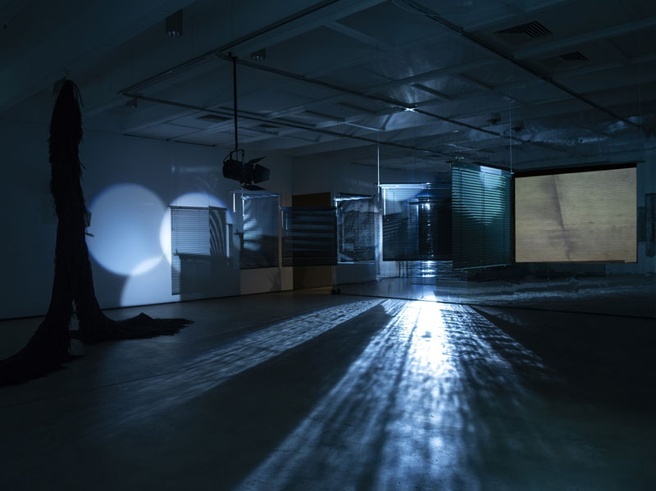 Although formally distinct, the works in this exhibition – from the artist’s latest video essay Doubles and Halves—Events with Nameless Neighbors (2009), to the audio work The Story of a Bear-Lady in a Sand Cave (2009/2011) and the venetian blind installation Lethal Love (2008/2018) – are inextricably linked. Evoking the biographies of historical figures, mythical creatures, and self-reflective ideas of alienation and neighbourliness, as suggested by the exhibition’s title, each character nests within another, representing our interwoven, interconnected realities. Haegue Yang will also continue her series VIP’s Union(2001/2018-19) with a version for the Govett-Brewster by inviting ‘VIPs’ from different areas of society including culture, sports, business, and politics to lend their favorite chair or table which will form a temporary ‘community’ within the gallery. 그래픽 디자이너 김영나가 전시 기획자 프렘 크리슈나무르티(Prem Krishnamurthy), 에밀리 스미스(Emily Smith)와 함께 공동 예술감독으로 참여한 피크라 그래픽 디자인 비엔날레 《Ministry of Graphic Design》가 오는 11월 30일까지 아랍에미리트 샤르자 은행 건물에서 진행된다. 지난 11월 8일 처음으로 선보인 피크라 그래픽 디자인 비엔날레는 디자인 관계자들을 비롯, 40명 이상의 다양한 예술가들이 한자리에 모여 그들이 속한 지역과 세계를 반영한 역사적 작업을 작품과 병치해 선보인다. 이번 피크라 디자인 비엔날레의 테마는 ‘그래픽 디자인의 내각(Ministry of Graphic Design)’으로, 아랍에미리트의 혁신적 행정 구조와 위치를 반영하듯 총 6개의 조직 부서로 전시를 구성했다. 각 부서는 현재와 잠재적 미래에 대한 상상력을 탐구하고 현실화하는 그래픽 디자인의 영향을 다채롭게 구현하는 데 초점을 맞추고 있다. 이러한 비엔날레의 개방적 접근은 그래픽 디자인 시장을 빠르게 성장, 발전시키는 상업적 의미를 넘어 그래픽 디자인을 사회 및 문화적 활동 분야로 간주하고 더 넓은 의미로 활용할 수 있는 발판을 마련한다는 점에서 의의가 있다. 김영나는 현재 서울과 베를린을 오가며 ‘테이블 유니온’의 멤버로도 활동 중이다. 2009년부터 2012년까지 계간 ‘그래픽(GRAPHIC)’ 매거진의 아트디렉터 및 편집자로 컨셉과 디자인을 총괄했으며, 2015년부터는 김영나의 모노그래프 를 기반으로 연계한 프로젝트를 이어왔다. 브루노 비엔날레, 쇼몽 그래픽 디자인 페스티벌, 서울 국제 타이포그래피 비엔날레 큐레이터로도 활동했으며, 국립현대미술관, 런던 빅토리아 앨버트 뮤지엄, 뉴욕 MoMA, 밀라노 트리엔날레 뮤지엄 등 국내외 다양한 전시에 참여한 바 있다. 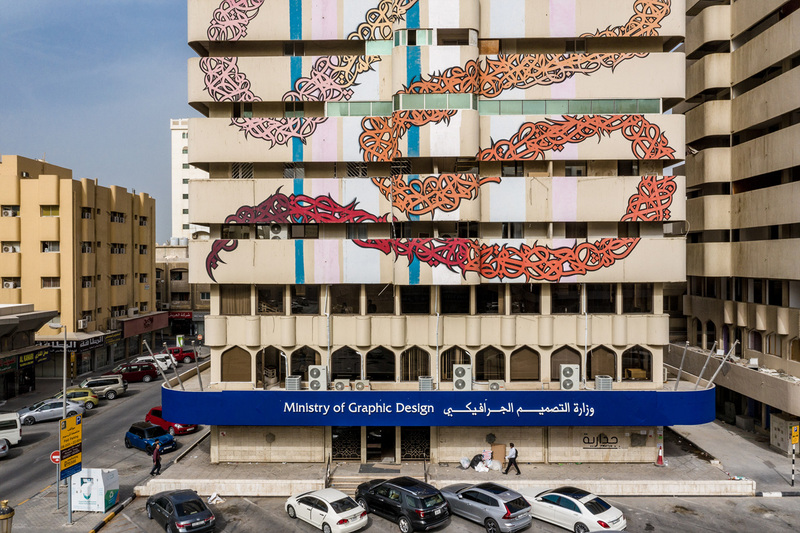 The graphic designer Na Kim is one of the three artistic directors—alongside Prem Krishnamurthy and Emily Smith—of the inaugural edition of Fikra Graphic Design Biennial titled Ministry of Graphic Design, on view through November 30, 2018 at the Bank of Sharjah. The first edition of Fikra Graphic Design Biennial 2018 gathers over forty hybrid practitioners, independent initiatives, collective voices, enthusiastic newcomers, and others whose practice engages with design. Their projects are juxtaposed with historical work from both the region and the world. Reflecting on innovation-focused administrative structures and positions in the United Arab Emirates, the theme of the Biennial, Ministry of Graphic Design comprises of six curatorial “Departments,” each focusing on diverse display formats exploring graphic design’s influence in shaping the present and imagining potential futures. The Ministry’s open-ended approach sets the stage for considering graphic design beyond its fast-paced commercial definitions as a broader social and cultural field of action. Na Kim is currently based between Seoul and Berlin as a member of Table Union. She was responsible for the spearheading the concept and design for GRAPHIC Magazine from 2009 to 2011 and has initiated series projects based on her monograph SET since 2015. In addition, Kim has been a curator for Brno Biennale, Chaumont Festival, and Seoul International Typography Biennale. Kim’s works have been included in many institutional exhibitions around the world including the Museum of Modern and Contemporary Art Seoul, Victoria & Albert Museum, Museum of Modern Art, Milan Triennale Museum, and Die Neue Sammlung amongst others. ‘중국 전통문화의 전진, 현대미술의 발전’이라는 비전을 기반으로 2017년에 설립된 중국 상하이 소재의 파워롱 미술관은 오는 11월 8일부터 2019년 3월 2일까지 《한국의 추상미술: 김환기와 단색화》전을 개최한다. 이번 전시는 중국에서 한국 추상미술을 대규모로 소개하는 최초의 전시로, 추상미술의 대가 김환기를 비롯해 단색화의 거장 권영우, 정창섭, 박서보, 정상화, 하종현, 이우환의 1970년대부터 오늘날에 이르는 주요 작품 1백여 점을 한 자리에서 선보이며 한국 단색화의 연대기를 집중 조명할 계획이다. 《한국의 추상미술: 김환기와 단색화》전은 지리적으로 같은 동아시아지만 구상미술이 상대적으로 우세했던 중국에서 일본의 구타이 그룹, 모노하와 더불어 제 2차 세계 대전 이후 아시아 현대미술에서 가장 유의미한 흐름 중 하나로 자리 잡은 단색화의 전면을 체계적으로 소개하는 흔치 않은 기회다. 또한 제56회 베니스 비엔날레의 병행전시로 열린 《단색화》전(2015)과 벨기에 보고시안 재단과 연 《과정이 형태가 될 때: 단색화와 한국 추상미술》 특별전(2016)에 이어 국제적으로 단색화의 미학과 가치에 대한 담론을 형성하는 중요한 자리다. 파워롱 그룹의 문화사업을 총괄하는 상임이사 쉬화린(许华琳)은 “단색화 작품에서는 자연에 순응하면서도 모든 것이 자연스럽게 흘러가는 듯한 침착함과 정교함이 느껴진다”며 “동양적 정서와 가치가 깃든 작품들은 물론 한국 추상미술가들이 걸어온 창작의 여정, 예술적 이념이 현 시대 중국 관객들에게 많은 시사점을 던져줄 것”이라고《한국의 추상미술: 김환기와 단색화》전에 각별한 기대를 표명했다. 이에 덧붙여 “이번 전시가 단색화를 포함한 동양 정신에 기반한 예술에 대한 탐구를 이끌고, 동아시아 전통문화에 대한 미학적 가치를 발굴하여 연구를 촉진하는 계기가 될 것으로 믿는다”고 포부를 밝혔다. 한편 같은 기간 파워롱 미술관에서는 중국의 저명한 큐레이터 뤼펑(呂澎)이 기획한 《예술가 40 x 40 : 40인의 예술가를 통해 본 개혁개방 이후 40년 간의 중국현대미술(ART HISTORY：SHAPED BY 40 ARTISTS)》전이 개최된다. 올해 2018년은 중국이 개혁개방 40주년을 맞이한 해로, 파워롱 미술관은 1978년부터 현재까지 가장 활발히 활동 중인 중국작가 40인의 작품을 통해 중국 현대미술의 행보와 자취를 회고하는 대규모 전시를 마련했다. 나란히 선보이는 두 개의 대규모 전시는 각기 다른 맥락에서 양국 미술 역사의 주요 단면을 직접 비교할 수 있는 흔치 않은 기회가 될 것으로 보인다. Founded in 2017 with a mission to “carry forth Chinese traditional culture, promote contemporary art,” Shanghai’s Powerlong Museum (宝龙美术馆) is pleased to announce Korean Abstract Art: Kim Whanki and Dansaekhwa, the first comprehensive exhibition of Korean abstract art to be held in China, on view from November 8, 2018 to March 2, 2019. The exhibition features seminal works by the 20th century master of Korean abstract painting Kim Whanki, along with leading figures of Dansaekhwa including Kwon Young-Woo, Chung Chang-Sup, Park Seo-Bo, Chung Sang-Hwa, Ha Chong-Hyun, and Lee Ufan. The exhibition provides a historical overview of Dansaekhwa, bringing together more than one hundred pieces from the 1970s to the present and introducing a full chronology of its evolution. Korean Abstract Art: Kim Whanki and Dansaekhwa is a rare opportunity to comprehensively survey the influential movement and its historical context. Dansaekhwa is a uniquely Korean art movement widely celebrated as one of the most compelling chapters within the history of postwar art in East Asia along with the discrete movements originating in other parts of the region, including realist art in China and the Gutai group and Mono-ha in Japan. The exhibition at the Powerlong Museum follows two previous installments, Dansaekhwa, an official Collateral Event in the 56th Venice Bienniale in 2015 and When Process Becomes Form: Dansaekhwa and Korean Abstraction, held in collaboration with the Belgium-based Boghossian Foundation in 2016. This third exhibition establishes a platform for continued dialogue on the aesthetic impact and ongoing importance of Dansaekhwa and is noteworthy for being held in China where regional themes and related art histories can be directly engaged. Concurrently, the Powerlong Museum will also open an exhibition titled ART HISTORY SHAPED BY 40 ARTISTS, curated by the renowned Chinese curator Lv Peng. This year marks the 40th anniversary of the Chinese economic reform that took place in 1978 and in order to commemorate the occasion, the Powerlong Museum will celebrate the vital role of modern and contemporary art through the work of forty outstanding artists who have been active in both China and abroad since 1978. Combined with Korean Abstract Art: Kim Whanki and Dansaekhwa, these two exhibitions will provide a platform to juxtapose parallel chapters of art history from both Korean and Chinese perspectives. 양혜규는 오는 11월 4일까지 이탈리아 트리엔날레 디 밀라노(La Triennale di Milano)에서 개인전 《훌라 시리즈 #02 양혜규: 외줄타기와 그것의 말 없는 그림자》를 선보인다. 지난 10년간 이탈리아의 젊은 작가들을 지원해온 패션 브랜드 훌라(Furla)가 새롭게 기획한 ‘훌라 시리즈(Furla Series)’는 자국 내 국공립 미술관의 국제적 전시를 지원하는 프로그램으로, 올해 양혜규를 두 번째 작가로 선정하였다. 트리엔날레 디 밀라노와 훌라 재단의 협업으로 마련된 이번 전시는 양혜규가 이탈리아 기관에서 갖는 첫 번째 개인전이며, 큐레이터 브루나 로카살바(Bruna Roccasalva)가 기획했다. 양혜규는 《훌라 시리즈 #02 양혜규: 외줄타기와 그것의 말 없는 그림자》에서 ‘외줄타기(Tightrope walking)’를 일종의 아름다운 춤으로 규정하며 전시의 모티브로 삼았다. 총 세 개의 섹션 중 미니멀하고도 개념적인 접근을 강조한 첫 번째 전시실에서는 실 설치작 <134.9 m³>(2000-2018)와 분필드로잉 작업 <81 m²>(2002-2018)가 전시된다. 다감각적 환경의 공동체로 형상화된 두 번째 전시실에서는 총 176개의 블라인드로 구성된 대형 블라인드 조각 <성채>(2011)가 소개되며, 마지막인 세 번째 전시실은 종이 콜라주와 색 비닐로 이루어진 <신용양호자들>(2010년 이후)을 활용한 벽 작업으로 장식적인 무도장을 연상시킨다. 또한 <신용양호자들>이 대형 벽화처럼 펼쳐진 네 벽을 배경으로 <의상 동차動車>(2011년 이후) 연작의 신작 2점 <의상 동차動車 – 우람 머리통>과 <의상 동차動車 – 덩치 새>를 선보인다. 이탈리아의 저명한 출판사인 스키라(Skira)는 이번 전시 《훌라 시리즈 #02 양혜규: 외줄타기와 그것의 말 없는 그림자》에 맞춰 영어와 이탈리아어로 된 선집(Anthology)을 2019년 5월에 출판할 계획이다. 총 416 페이지의 이번 선집은 2006년부터 2018년까지 발표된 다수의 에세이와 대담 중 최종적으로 14편 가량이 선별되며, 양혜규의 대표작을 포함한 전시 출품작의 다양한 이미지들이 수록될 예정이다. at La Triennale di Milano through November 4th, 2018. Furla Series is an annual program launched by Fondazione Furla, the art foundation founded by the Italian luxury brand Furla that has been fostering young creative talent in Italy for the past decade. Launched in fall of 2017, Furla Series features exhibitions and events dedicated to leading contemporary artists, organized in collaboration with Italy's foremost national and public art institutions. 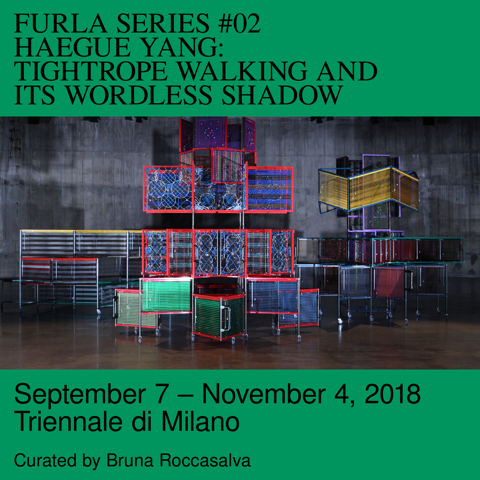 Haegue Yang: Tightrope Walking and Its Wordless Shadow marks Yang's first institutional solo show in Italy and the second installment of the Furla Series, curated by Bruna Roccasalva and co-organized by Fondazione Furla and La Triennale di Milano. 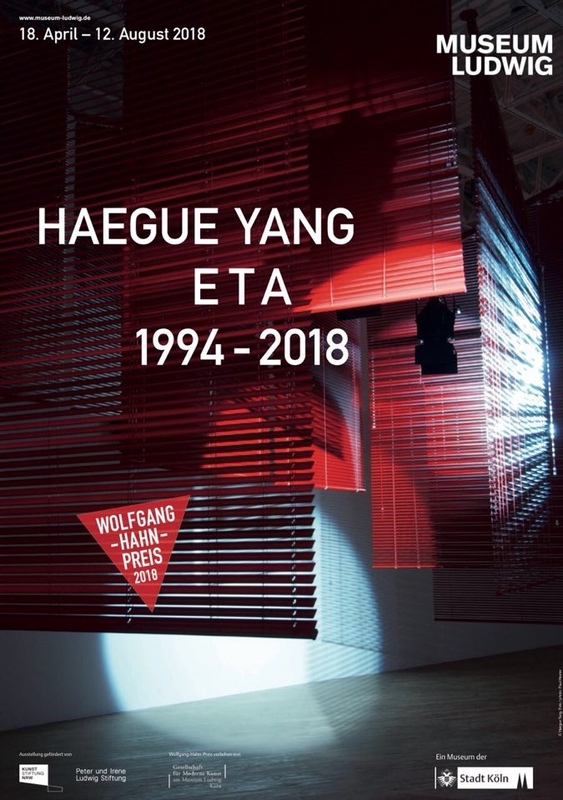 Taking cue from the title Haegue Yang: Tightrope Walking and Its Wordless Shadow, Haegue Yang defines "tightrope walking" as a beautiful dance that dictates and serves as a motif for her exhibition. From the three rooms in the exhibition, the minimalist and conceptually driven first room of the show ushers the viewer into a space occupied by the thread installation 134.9 m³ (2000-2018) and chalk drawing 81m2 (2002-2018). The second room which solely contains Cittadella (2011), the monumental installation constituting of 176 Venetian blinds creates a multisensory environment of intricate modular structure. The final room of the exhibition leads the viewer into a space evocative of an ornate ballroom, its walls decorated with paper collages and colored vinyl film that constitute the series Trustworthies (2010-). The mural-like piece that that unfolds across the four walls of the room serves as a backdrop for two newly-conceived performative sculptures from the Dress Vehicles (2011-) series. To coincide with the show Haegue Yang: Tightrope Walking and Its Wordless Shadow, the respected Italian publishing house Skira will publish an anthology on the artist with texts in both English and Italian in May, 2019. The anthology includes a total of 416 pages and 14 of the most significant essays and in-depth interviews on the artist’s work from 2006 to 2018, and features a large selection of images of landmark pieces and works on display. 국제갤러리가 오는 8월 24일 부산점을 개관한다. 서울 소격동 소재의 국제갤러리는 1982년 개관 이래 최초의 분점인 부산점을 부산 수영구 망미동에 위치한 복합문화공간 F1963에 약 100평 규모로 연다. 해외 대형 갤러리들이 글로벌 진출 전략의 일환으로 전세계 곳곳에 분점을 개관하는 추세와는 달리 국내 활동만을 고수해왔던 국제갤러리는 부산만의 국제성과 지역성, 문화예술 인프라를 주요하게 인식하여 부산점을 개관하기로 결정했다. 2014년부터 아트 부산 등에 꾸준히 참가하며 영남 지역에서 꾸준히 국내외 작가들과 작품을 소개해온 국제갤러리는 부산이 고유한 에너지를 바탕으로 한국 미술의 또 다른 국면과 발전을 보여주는 아시아 미술의 주요 도시로 자리잡을 것이라 확신한다. 이번 부산점 개관을 기념하며 국제갤러리는 그 동안 쉽게 접할 수 없었던 세계적인 국내외 작가들의 작품을 선보인다. 국내작가로는 이우환, 권영우, 박서보, 하종현 등 단색화 거장의 작품부터 문성식, 양혜규 등의 작품을 선보일 예정이다. 해외작가로는 아니쉬 카푸어, 로니 혼, 칸디다 회퍼, 우고 론디노네, 빌 비올라, 바이런 킴 그리고 지난 봄 F1963에서 개인전을 개최한 줄리안 오피 등의 작품이 소개된다. 국제갤러리는 대중적인 복합문화예술공간 F1963에 입점함으로써 해당 지역의 미술 애호가들은 물론 지역 시민과 더욱 가까워지는 좋은 계기가 될 것으로 기대하고 있다. 앞으로 부산점만의 공간 특성을 고려하여 동시대 미술을 대표하는 국내외 소속 작가들의 작품들을 선보이는 등 다채로운 프로그램을 통해 부산에서의 새로운 행보를 이어갈 예정이다. 국제갤러리 부산점은 화요일부터 일요일 오전 10시부터 오후 6시까지 운영된다. Kukje Gallery Busan will open on August 24, 2018. Founded in 1982 and based in Sogyeok-dong, Seoul, Kukje Gallery is launching its first-ever outpost at a scale of approximately 330m2 in F1963, a cultural complex located in Mangmi-dong, Suyeong-gu, Busan. Diverging from the global expansion strategy utilized by mega-galleries abroad, Kukje Gallery is steadfastly committed to remaining domestic, instead of following the overwhelming trend of launching outposts around the world. Kukje Gallery's decision to open its first outpost in over 35 years since its founding is established on the recognition of the importance of Busan's international and regional outreach, along with the city's substantial cultural and artistic infrastructure. Since 2014, Kukje Gallery has been a regular exhibitor at Art Busan, regularly introducing works by major Korean and international artists to audiences in the Yeongnam region. The gallery strongly believes that Busan will establish itself as the new arts hub of Asia and feature a new facade of the Korean art scene. To celebrate the inauguration of the Busan branch, Kukje Gallery will showcase works by a roster of renowned Korean and international artists who were seldom showcased in the city. The inaugural installation will present works by leading Dansaekhwa artists including Lee Ufan, Kwon Young-Woo, Park Seo-Bo, and Ha Chong-Hyun, along with those by Sungsic Moon and Haegue Yang. Works by these foremost Korean artists will be shown in dialogue with works by an international roster of artists such as Anish Kapoor, Roni Horn, Candida Höfer, Ugo Rondinone, Bill Viola, Byron Kim, and Julian Opie, whose first solo showcase in Busan took place at the F1963 earlier this year. By opening its Busan branch in the popular cultural complex F1963, Kukje Gallery anticipates a wider and more extensive outreach not only to the regional art lovers but also to the general public. Kukje Gallery will introduce a diverse range of programs to the Busan audiences, showcasing works by the gallery's foremost contemporary artists in dialogue with the unique attributes of the F1963 space. Kukje Gallery Busan will be open from 10am to 6pm every Tuesday through Sunday. Park Chan-kyong and Kyungah Ham are participating in a group exhibition titled Paradoxa 2018. Art from Middle Korea at Casa Cavazzini, Udine, Italy. Curated by Denis Viva, the project focuses on the notion of paradox and contradiction. 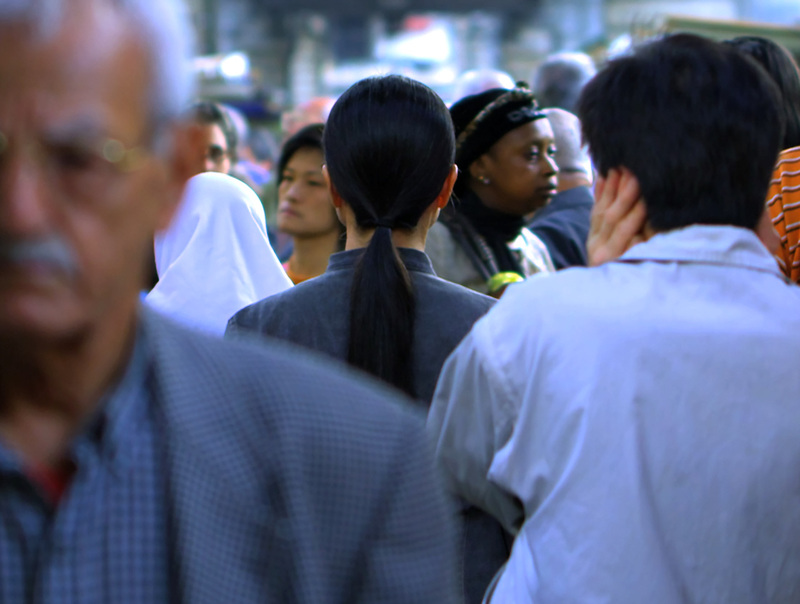 Park Chan-kyong and Kyungah Ham aim to address the issue of their national identity within complex political dynamics by involving other possible cultural background, alternative representations, or new forms of interactions between different perspectives. Kyungah Ham will show What you see is the unseen/ Chandeliers for Five Cities BC 02-05 (2015-2016), a large tapestry made by North Korean embroiderers the artist hired clandestinely. The work is about communication that circumvents censorship and includes occult slang phrases, pop images, song lyrics, and other western contents censored by the regime of North Korea. Park Chan-kyong will present Child Soldier (2017), is a digital video made by photographing each scene with a 35mm film camera. The photographs depict a North Korean soldier–a young boy–who wanders the woods, seemingly with no intention. These images of childhood contrast with the image of North Korea that is often constructed by the media—an image marked by militant patriarchal violence and radical ideologies. 박찬경과 함경아는 7월 21일부터 10월 14일까지 이탈리아 우디네 Casa Cavazzini에서 개최되는 그룹전 《Paradoxa 2018. Art from Middle Korea》에 참가한다. 이탈리아의 미학자 겸 큐레이터 데니스 비바(Denis Viva)가 기획한 이번 전시는 역설과 모순이라는 개념에 중점을 두고 있다. 박찬경과 함경아는 서로 다른 문화 배경간의 이질적인 조합, 대안적인 재현 그리고 전통, 소수민족, 세계화 등에 대한 다양한 관점을 가로지르는 새로운 소통을 통해 복잡한 정치적 구도 안에 위치한 국가의 정체성에 대한 탐구를 지속해왔다. 함경아는 이번 전시에서 대표작인 자수 작업 (2015-2016)를 선보인다. 이 작품은 작가가 북한 자수 장인들을 은밀히 고용하여 제작한 것으로, 북한 정권이 검열하는 주술적(오컬트) 언어, 대중문화에서 비롯된 이미지 및 노래 가사, 서양문화의 흔적을 포함하고 있다. 이는 서양문화를 배척하는 북한의 국수주의적 검열과 그를 교묘히 회피하는 방식 간의 역설적 관계를 시사한다. 박찬경의 <소년병>(2017)은 35mm 필름 카메라로 촬영된 사진 이미지들을 투사하는 디지털 비디오 작품이다. 영상에 등장하는 인민 군복 차림의 한 소년은 아무런 목적이나 의도 없이 숲 속을 배회한다. 영상 속 소년의 순진무구한 모습은 종종 언론에 의해 그려지는 북한군의 극단적인 이데올로기와 폭력적인 가부장제의 표상과 대조된다. Over the last 4 months, Museum Ludwig has provided a variety of events, some of which call for audience participation, that expand on Yang’s artistic practice. The artist discussed her diverse interests and extensive research behind her work in ‘Art in Context,’ the lecture series that has been organized by GMK(Gesellschaft für Moderne Kunst), the sponsor of the museum, for a decade now. From the music and film program conceived by Yang to an evening program for which the visitors’ furniture was displayed at the museum entrance in connection with the Cologne version of VIP’s Union (2001) consisting of borrowed chairs and tables of the local figures, the accompanying events of Yang’s first-ever retrospective successfully marked her presence not only in the art world but also to the general public. 독일 쾰른의 루트비히 미술관에서 성황리에 진행 중인 양혜규의 회고전 《도착 예정 시간(ETA) 1994 – 2018》이 오는 8월 12일 폐막을 앞두고 있다. 지난 25여 년에 걸친 작가의 고유한 작업 세계를 총망라한 이번 대규모 회고전은 지난 4월 17일 개막한지 15주 만에 관람객수 55,000여 명을 돌파하며 크게 주목 받았다. 양혜규의 ‘볼프강 한 미술상(Wolfgang Hahn Prize)’ 수상과 연계된 이번 전시는 유명 미술 전문지 및 대중매체를 통해 집중 조명되었다. 독일의 예술생활 잡지 <모노폴 Monopol>은 이번 전시를 '아트 쾰른 주간에 반드시 방문해야 할 곳’으로 선정했고, 미국의 미술 전문지 <아트뉴스 ARTnews>는 “양혜규의 다면적인 작업을 온전히 이해할 수 있는 완벽한 기회를 제시한다”고 평했다. 지난 4개월여 동안 루트비히 미술관은 양혜규의 작업세계를 확장, 심화하는 다양한 연계 행사와 관객 참여의 기회를 제공해왔다. 루트비히 미술관을 후원하는 근대미술협회(GMK)가 10년째 주관하는 ‘Art in Context’ 강연 시리즈의 일환으로 작가의 광범위한 관심사와 작업의 근간이 되는 폭넓은 연구에 대한 대담을 개최했다. 또한 작가가 직접 기획한 공연 및 상영 프로그램과 쾰른 저명인사의 가구를 전시 기간 동안 대여 받아 약식 버전으로 탄생시킨 (2001)의 연계 행사로 실제 관람객들의 가구를 하루 동안 미술관 입구에 진열하는 등의 행사는 전세계 미술 관계자뿐 아니라 대중 관객들에게 양혜규의 존재를 성공적으로 각인시켰다.